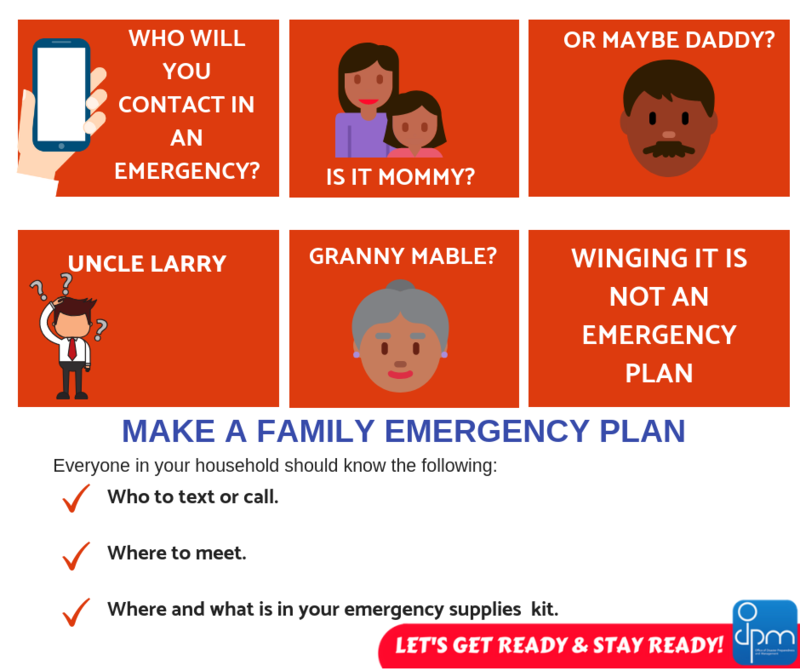 What if you are separated from your family during a disaster, how would you communicate with them to ensure that they are safe? How will you let them know that YOU are safe? During a disaster, communication networks and electricity are two of the first utilities to become disrupted. As such, developing a family emergency communication plan will help ensure that all members of your household including children, persons with disabilities or special needs and caregivers know how to reach each other or where they can meet in the aftermath of a disaster. 1. Write - Collect and write the contact information for all members of your household including caregivers. Include the contact numbers for first responders such as the Police, Fire Services, and Ambulance, contact numbers for educational institutions that your children attend, the nearest medical facilities, doctors and your municipal corporation. Designate a contact person who lives outside of your area (such as a relative or close family friend) who can also act as that point of contact for members of your family to reconnect with during a disaster. Finally, select a common meeting place/muster point where members of your household can reunite. A family muster point can be the home of a relative or close family friend, community centre, church or a safe public venue. If there are persons in your household with special needs or a disability, be sure that this common location is easily accessible to them. 2. Share - Make sure everyone in your family carries a copy in his or her book bag, purse, or wallet. You should also post a copy in a central location in your home, such as your refrigerator or family bulletin board. Ensure that all members of your family are familiar with and can easily recite key contact numbers such as your home contact, your cell phone contact and emergency services. 3. Practice your plan regularly so that it becomes a routine for members of the household. If there is the need for revisions, ensure to update your plan and re-share with your family. Here is a cut out of a family communication plan for your children’s book bag. Fill out the form below with your children, laminate and place in their book bag or wallet. Ensure his/her teacher knows where it is located. Click here to download the entire pdf. To download a copy of an adult family emergency communication plan please click here.